installed by a friend in the carpentry trade. this floor was installed about 1.5 years ago. and these past few months we started seeing a gap which has now gotten to be about almost 1/2" wide. you can clearly see that the bamboo "click lock" "tongue" has broken and the floor has now separated. the material was purchased from everyone's FAVORITE supplier. lumber liquidators. i have filed a complaint , but have been playing phone tag with them for about 6 weeks now. and i cant simply pull the rest of the floor up to repair this center section , because alot of the end boards click lock joints were glued, so separating those boards will surly break the fragile click lock "tongue"
has anyone seen a bamboo click lock floor fail like this? I thought i researched and bought a good product, but after these past few weeks of reading everyone's horror stories with bamboo, and with lumber liquidators I totally regret this purchase. this was installed in our first home, and now we have this horrendous gap right in the middle of our floor to look at... It couldn't be in a worse spot in the room! I install quite a bit of bamboo flooring. It is particular, and I hate all floating bamboo flooring. It appears from your pictures that there is some cupping of the boards. What is your climate where you live? What is the rh in your home? What type of moisture barrier did you put under your cork? If it has gotten to dry in your home Bamboo will shrink terribly bad. So maintaining your rh is key. I usually recommend in our area that my customers maintain their rh at about 55% if they are installing an bamboo floor. 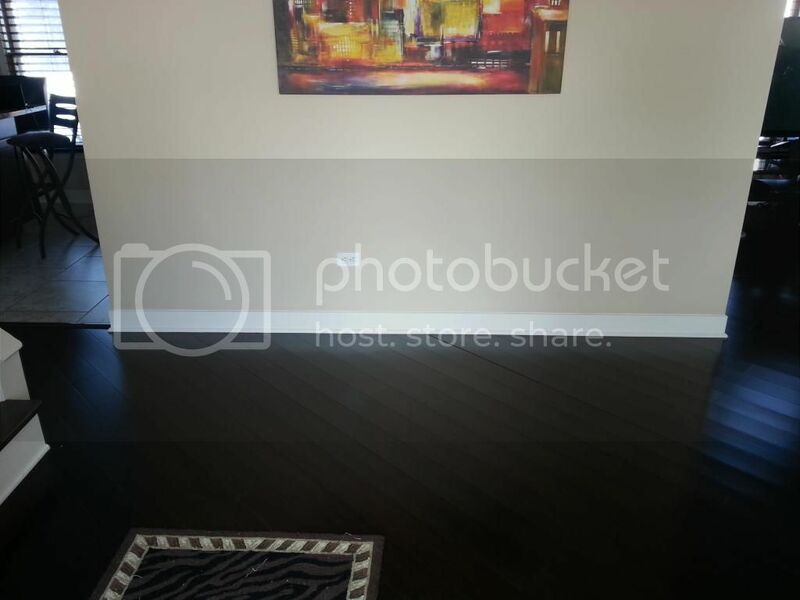 Technically speaking floating floors are also to be broken in all doorways and hallways as well it appears from your photo you didn't break this when going into the adjoining room. I could be viewing that wrong sorry if I am. However if you didn't since you ran it on a 45 degree angle if it shrunk up it could have put to much strain on the floor causing it to pull apart. It can be fixed you however will need to call in a professional to be able to do it. While it is nice to have friends that are willing to help if it isn't their line of expertise then usually their help is rather limited. A carpenter is not a flooring installer, hanging trim and doors is a different ballgame and framing up walls doesn't even come close. Point being but sorry you get what you pay for. Had you hired a professional that had all the correct moisture meters and knowledge of the product you may have never ran into this problem. and then my blog in case you missed it on the other flooring forum you posted this on. I have the Morning Star Bamboo floating floor. When it was first installed they did not put in transitions to separate the rooms so I had gaps and separations and it became un-clicked. I didn't know I needed transitions and probably wouldn't have bought this floor if the sales person or installer informed me about this but I agreed if it would solve the problem. Two months after the repair (even with the proper transitions) it still separated and gapped. I have a humidifier and meter and went by all the guidelines. Humidity was in the right percentage. Not only did I get gaps but I have a 1 1/2 inch gap from the edge of the base molding that runs down the entire perimeter of one wall. The floor was installed without the base board. Called Lumber Liquidators and they sent one of "their" inspectors who did anything and everything to exonerate LL and blame it on me or the installer. This is not unusual. If you read all the complaints on the internet, this is how they operate. I wanted this flooring out of my house not only because I feel it's a defective floor but they advertise it as being "green." How can a floor be "green" if it's loaded with "formaldehyde?" Both my husband and I have experienced sore & dry throats, burning eyes and theres a very distinct smell. I know there are many things that have formaldehyde in them from China, such as toys, household items but having two rooms and a hallway full of this product I feel is hazardous to our health. In 2010 President Obama signed into law The Formaldehyde Standards for Composite Wood Products Act. This Act limits the amount of formaldehyde that can be used in composite wood products. Two accredited laboratories in California did testing on Lumber Liquidators Chinese flooring and found it to be 3.5 times over the legal limit. This is in gross violation of the CARB (California Air Resource Board) which took effect in 2009. The formaldehyde standards that President Obama signed into law are identical to California's emission standards. By law, the box should be labeled "compliant for formaldehyde." My boxes had "no labeling" ... or anything on the box! I don't know about you, but I wouldn't want my children crawling on this floor! And the 30 year warranty.....you can forget about that, it means nothing. Lumber Liquidators has more loop holes then I have ever seen. That warranty is to protect them.....NOT YOU! Sounds like a stranded bamboo. The resin slows the release of the moisture content, like really really slow. Most if not all meters cannot accurately read the moisture content of stranded. Oven dry method is the only accurate way to check MC in stranded. And how many installers know how to over dry bamboo or wood? The chinese don't even use meters on it. Seen this scenerio played out many times on forums. Yes...it is a stranded bamboo and you are absolutely correct about measuring the moisture content......it's almost impossible and a good installer will tell you that. I have a feeling this has been an issue with Lumber Liquidators because at first their recommendation was to just open the ends of the boxes to let the flooring acclimate. This was originally good for the consumer because if you remove all the flooring from the boxes Lumber Liquidators will not take it back. I've seen many complaints regarding this issue. I've also seen reviews of this stranded bamboo from other installers saying that after 2 weeks of being acclimated when they took it out of the boxes it actually felt damp! Now they want you to remove it out of the boxes. This flooring is ridiculous in what you have to go through to maintain it. First, you would have to live in a state that has a perfect stabilization of humidity (and I don't think that exists) or you become a humidity monitor (and who has time for that?) And did I mention when measuring several of the boards at different ends they were off by 1/16. After putting 20 or more boards together with this inconsistency .....yep....you're going to get gaps and separations. I have yet (and I've been on many forums regarding this matter) heard them say that there was a defect in their product. What a perfect little world Lumber Liquidators lives in.....we should all be so lucky! Yup, opening just the ends will shrink or swell the ends while the rest of the planks stay the same dimension. I learned that lesson many many blue moons ago. OMG I read the replies and all of them I could have written! 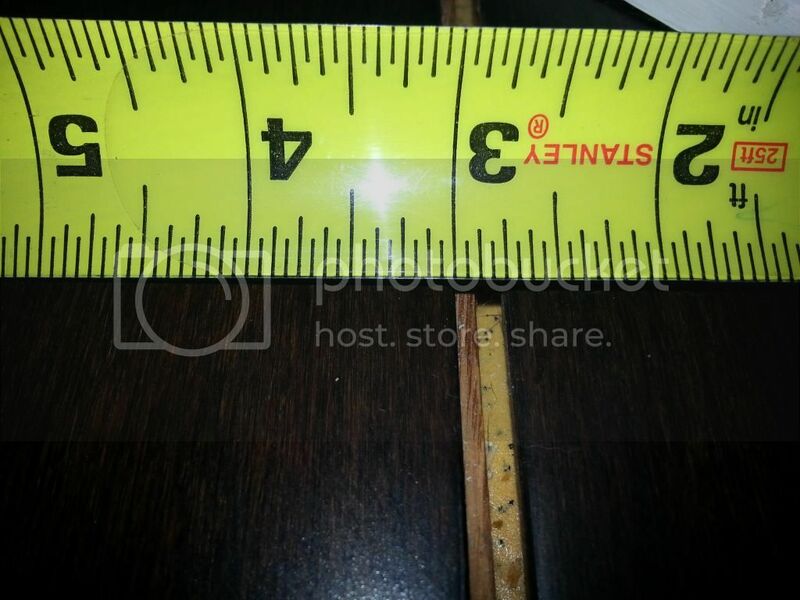 BUYER BEWARE - DO NOT buy from Lumber Liquidators especially the bamboo flooring from Lumber Liquidators! I also contacted Lumber Liquidators with a complaint and nothing! Everything was blamed on me , but I had a professional install the flooring. Still nothing. Bottom line - How do I fix the problem? there are gaps of over 1/2" thru the middle of the room. I can see moisture barrier parallel to the planks, not at the ends. How do you fix the problem without ripping out the whole floor? I spent the money to update a home to sell and in less then 6 months while I finished the rest of the remodel the Lumber Liquidator bamboo floor is gapping. Please help. Thanks for a reply. If you aren't or don't think you will be getting any response or compensation from Lumber Liquidators I would contact a lawyer. If you can't afford a lawyer then I would go to small claims court. I do know there is a class action suit against LL regarding this product "morning star bamboo." They have had many problems with the product and people have lost thousands of dollars due to the fact they always blame the consumer or the installer. Did you speak to your installer? 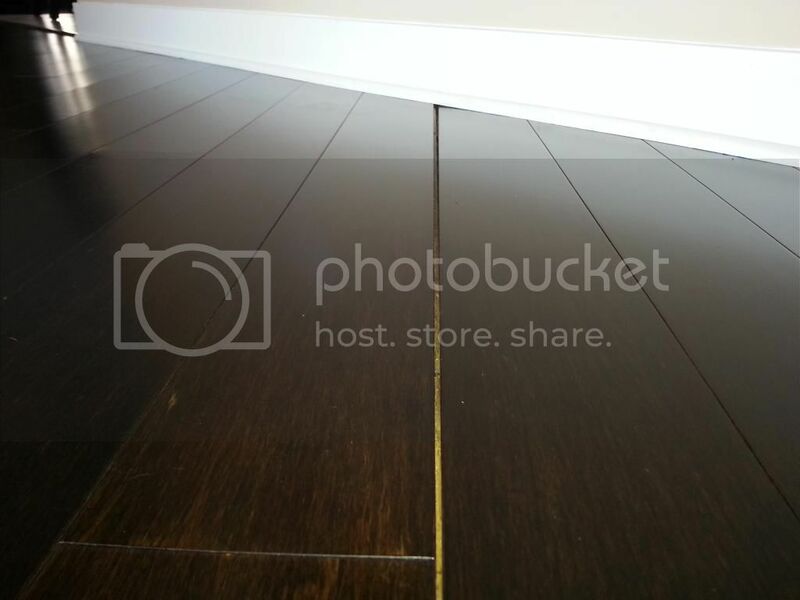 Was this installer hired through Lumber Liquidators? Did Lumber Liquidators send out an inspector? Make sure you document everything and take pictures! Good luck to you!